Well hopefully the higher court that Jag plans on taking this matter to will also rule the same as the Guyana Court of Appeal and put this matter to rest once and for all. He will have no other recourse but to wait for when the election is called next year but I’m sure he’ll be finding ways to disrupt the governance of the country in the meantime. Where in the constitution is the term “absolute” majority defined? Secondly, by whose mandate 0.5 has to be rounded up to 1.0 ? 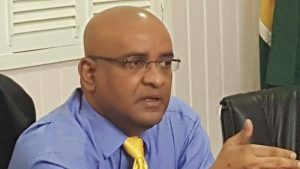 Jagdeo/PPP have rational grounds to have CCJ overturn this silly, partisan decision. Ps. Granger knew all along he will get this partisan decision, that is why he waited two months to tell GECOM to get moving. I have shown here recently that the published GECOM worksheet of 2015 elections have errors in it. It is on those fictitious numbers the current gov’t took power. So this latest split court decision is just another of the wrongs that Guyanese must tolerate. Wrong and Strong! What a joke. These clowns are worse than Trump and associates. The general population should aim at educating themselves and their children in a proper manner, if possible, then oust Guyana of these MP from all parties and ban them from holding office. The judiciary is lacking in education period! Does anyone find it a conspiracy that once the PPP/C Indo elite were kicked from office that Exxon began discovering oil? President Granger and the AFC coalition are stooges for the American Empire. Why would I support the AFC when they are PPP/C rejects who are bankrolled by the USA deep state? All of you government bashers are forgetting something. ChanderRASS is a turncoat who went to bed with Jag for a price in order to cause confusion in the governance of the country. Up to now he’s afraid to return to the country he betrayed in the worst way. Before the 33 or 34% came into play, Guyana had a legitimate government that was accepted by the international community. Now we got an Opposition Leader grasping at straws and trying every nasty thing he can to get back the reins of Guyana. He’s blinded by the $$$$$ signs he’s seeing coming down the pipes and does not have the interest of Guyana at heart. Just look at who he’s planning to put up as a future President of Guyana…ALI…a lying, fraud, who up to now cannot produce the proof of his academic credentials. I guess that’s the kind of puppet President you would prefer because we all know who is hiding behind the curtains manipulating the strings. Guyana has a better future with the U.S. backing than it will ever have under the PPP headed up by a despicable man. Jump high or jump low….that’s a FACT!! !